It was a faux pas that was never to be for Tripura governor Tathagata Roy. 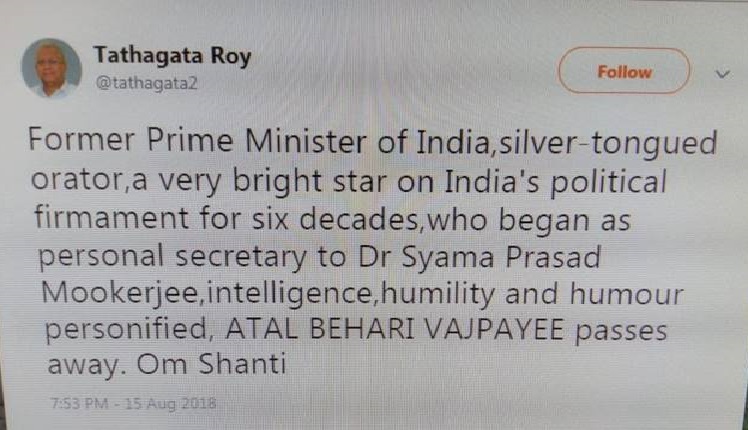 His tweet on August 15 evening declaring former Prime Minister Atal Bihari Vajpayee dead has raised eyebrows. Though, Roy, later apologized for the goof up. When twitterettis pointed out the goof up, the Tripura governor deleted his post and apologized for the mistake. “I am sorry I tweeted something upon being told by an all-India TV channel. I had taken it to be authentic. There has so far been no official announcement. I have deleted my tweet. Sorry again,” he said in another tweet on August 16. Interestingly, Tripura chief minister Biplab Kumar Deb on Independence Day goofed up by addressing the governor as ‘Da’ instead of addressing him as ‘Honourable’. ‘Da’ in Bengali means elder brother. Biplab Deb after attending the ‘At Home’ reception party hosted by the governor on Independence Day committed the mistake and thus broke protocol.